A cloudy and wet spring and early summer has gifted my garden with foliage growth galore. Joining in for Garden Bloggers’ Foliage Day, many thanks to Christina at Creating my own garden of the Hesperides for the opportunity to laud fabulous foliage in the garden. 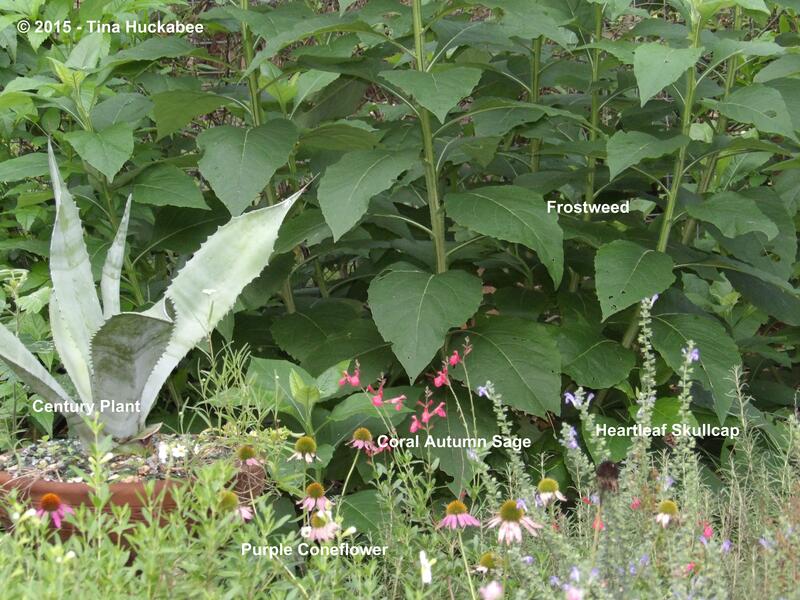 Toward the back of my large perennial garden, the Frostweed, Verbesina virginica, are towering over the sprinkling of blooms from the coral Autumn sage, Salvia greggii, Purple Coneflower, Echinacea purpurea, and the Heartleaf Skullcap, Scutellaria ovata, as well as a Century Plant Agave americana, happily situated in a re-purposed bird bath. Turning to the right, fab foliage continues with Iris straps fronting a red containerized Yucca filamentosa ‘Golden Sword’, paired with a cobalt-blue potted, but grey-leafed Ghost Plant, Graptopetalum paraguayense. 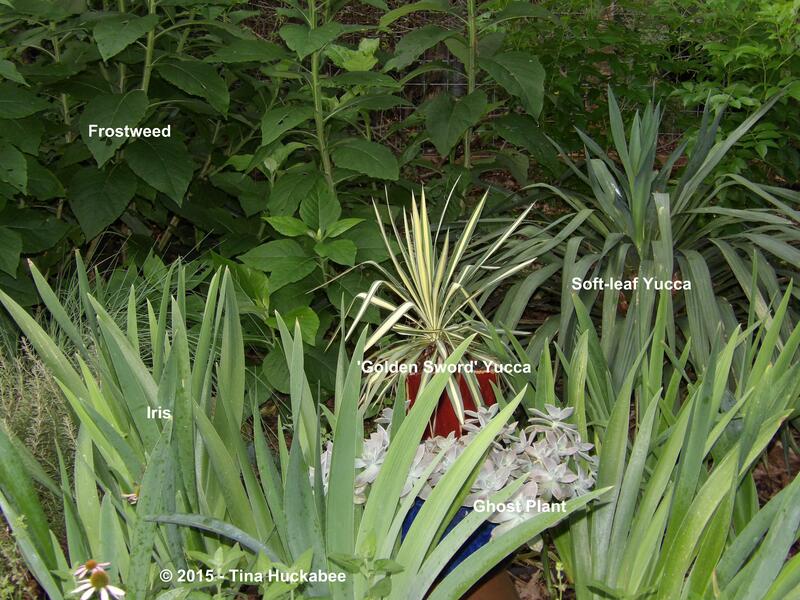 The handsome Soft Leaf Yucca, Yucca recurvifolia completes the spiky vignette. Stepping back from that shot, the Heartleaf Skullcap foliage and bloom panicles add some spice to the scene, while the Purple Coneflowers add a bit of sugar to the shot. With some twisty fun in a sparkly container, the Corkscrew Rush, Juncus effusus spiralis, has revelled in the wet year and this gardener has enjoyed not watering it! 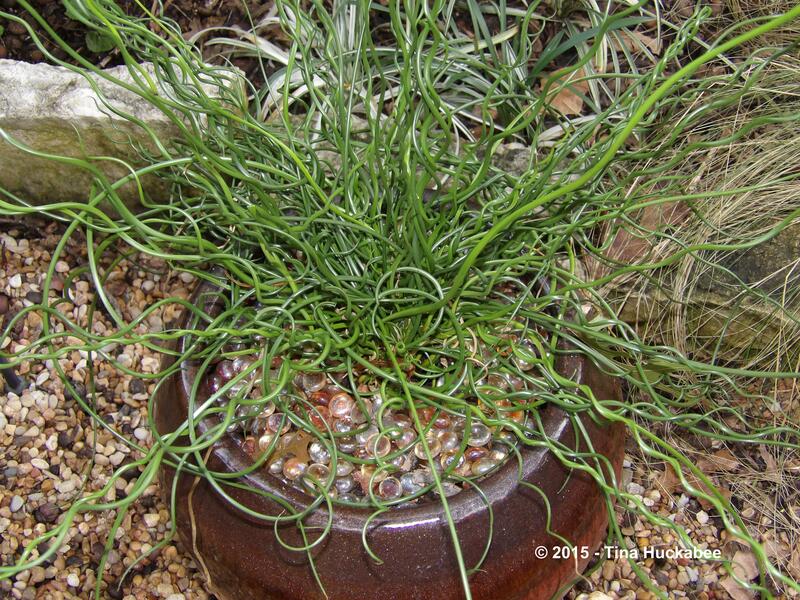 Corkscrew Rush is a bog plant, but I grow two of them in pots and except for once or twice per week hand watering during a normal Texas summer, this plant is an easy one for the garden. 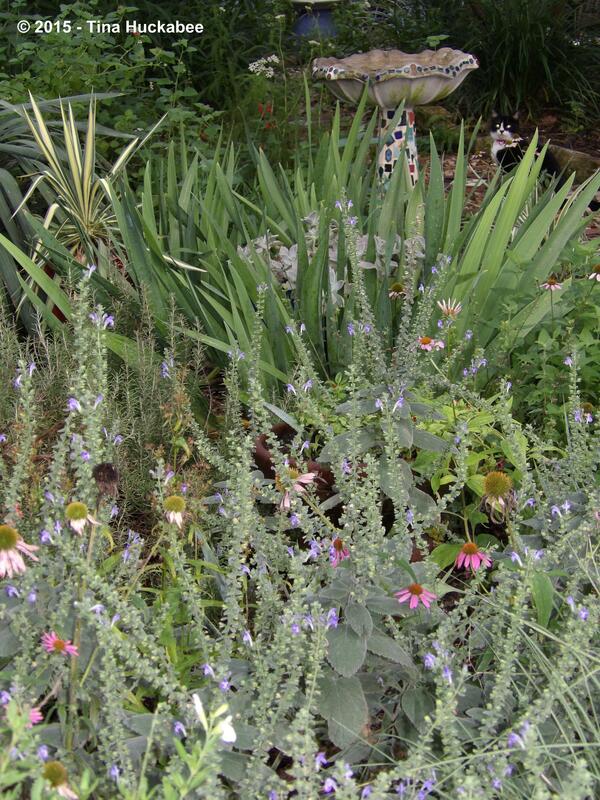 Lastly, the Purple Heart, Setcreasea pallida, is a hardy Mexican native, naturalized throughout much of South and Central Texas and an excellent shade-tolerant groundcover. With more sun, charming pink flowers appear which are favored by honeybees. This quirky set of ceramic totems play in this patch. 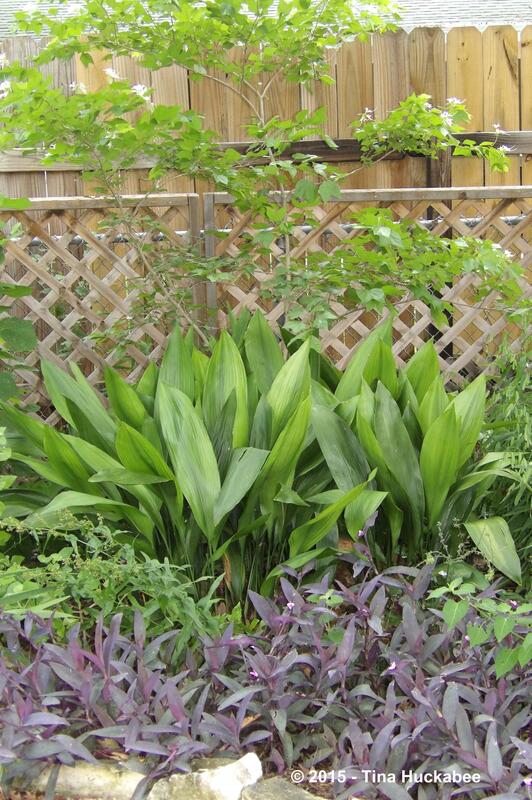 While this group of Purple Heart anchors a cluster of Cast Iron Plant, Aspidistra elatior, resting at the base of a graceful Mexican Orchid Tree, Bauhinia mexicana. So much foliage, so little time! Check out other June foliage delights at Creating my own garden of the Hesperides and good GBFD to you! 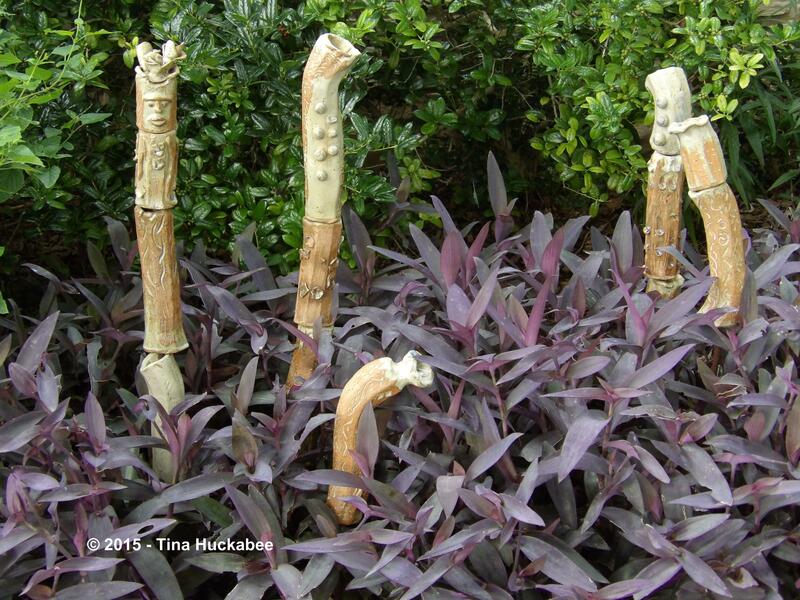 This entry was posted in Garden Bloggers' Foliage Day by Tina. Bookmark the permalink. I like the way you label the plants right on the photo–it’s so helpful for identification and to get a better idea of good plant combinations. Love the Corkscrew Rush! Thank you, Beth. The labeling is the same program as the copyright. Isn’t the corkscrew rush fun? I agree – it’s very helpful! My biggest problem with labeling is that I’m very bad about proofreading them–sloppy! I am glad the names help out though. I’m with Beth – the labeled photos are really helpful and I appreciate it. I also appreciate the longer views giving us plants in combination – one of your truest gifts – the ability to get adjacent groupings in play that provide season-round interest. 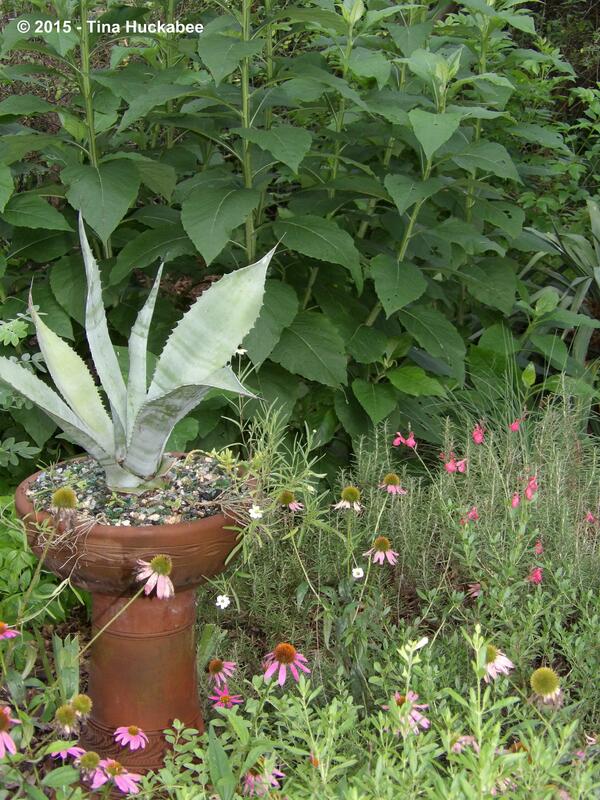 Putting the agave in the birdbath is clever – it gets elevated to receive a proper amount of attention and yet cannot throw pups out all over your garden beds from above. I’ve learned too late how prolific those determined agave mommas are, and often feel I should apologize to them for not being able to provide the kids with good homes of their own. I wish there was some form of agave neutering! The quirky totems are adorable and perfect above the purple. You must smile every time they greet your arrival. Did you make those? I’m trying to be more consistent about showing the close-up, then the wider view. When I read other blogs and look at the photos, it helps me envision the garden as a whole if I can see the fuller situation. You know, I’m not a fan of agave–or most other spiky plants. I must be the only gardener in Austin without any opuntia in my gardens. Freak! Agave are big, huge!, and they hurt me. I don’t like to be hurt by my plants–I get enough of that from my bees. 🙂 I do like the color (oh, that gorgeous blue-grey!) of the A. americana and structure in the garden is important, at least for people. All of my agave are in pots. They do pup out though, don’t they? I pot up the babies and when the containerized “adults” get too big, I dig them out of the pots and donate them to the cause of Dillo Dirt! I keep a supply of ready-to-transplant agave pups in my work area and when it’s time, grab the gloves and get to work. Yes, I made those odd totems. Actually, the group isn’t finished. At the end of the semester, I found two other pieces that I’d put in a cabinet in the studio. The pieces are bisqued, but I’ll need to wait until August to glaze and fire. I hope to situate the pieces together a bit more permanently, though I’m attempting a somewhat haphazard conglomeration of the group, so they don’t need to fit together precisely. I’m happy with the color of the glazes, especially in contrast to the Purple Heart. For once, something turned out like I envisioned! As usual it is a real treat to see your lovelies. I love the totems. Love them. They really are perfect: great colour, charming personality and the combo of twisty organic shapes with the knobby textures are just right. Thanks! I was really pleased with how they turned out. Cutting rebar to fit? That’s another issue! Heh. I do know if I saw those in a shop I’d assume I couldn’t afford to buy them! Really nice, Tina. Well, I’m very flattered. I would say that my ceramics are fun, though a bit clunky. I adore my classmates and teachers though. Lovely foliage Tina and I love those totem poles. Thanks, Chloris-the totems are fun, I think. Fabulous! Thank you fir joining and I apologise for being slow to comment but our travels have meant that I haven’t had much access to the Internet. Thanks, Christina for hosting and I hope you’re enjoying your travels.